(In the later period, frequently ‘Pre’ due to the addition of the definite article to the name; also frequently ‘Ra’, but note that the vowel is not the open ‘a’ as in ‘father’) Re is the great God of the city of Iunu or Ôn, a city the Greeks named ‘Heliopolis’, or ‘City of the Sun’, because Re is the God of the sun par excellence in the Egyptian pantheon. 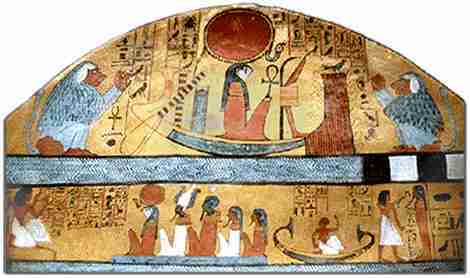 To say that Re is God of the sun is not to say that he is identical with the sun as a physical being, a distinction Egyptians registered by their use of the term aten to refer to the sun’s visible disk. Rather, Re is the divine potency in the sun and hence the focal point of the whole cosmos. Re’s nature and functions have more to do with the central position of the symbol of the sun in the totality of Egyptian thought than with the sun in a narrowly physical sense. Re’s most characteristic depiction is either as a hawk or a hawk-headed man wearing on his head a solar disk encircled by a cobra; as the night sun traveling through the netherworld, however, Re is usually depicted as a ram-headed man. Re travels across the sky in his bark or boat, which is called the mandjet in the day and the mesketet at night. Upon the solar boat the pharaoh himself in the Pyramid Texts wishes to serve as a mere oarsman (e.g., PT utterances 467, 469). An important motif in Egyptian theology is the defense of Re against his enemies, who are the enemies of the cosmic order, undertaken by other deities. Each deity in the pantheon, in some sense, in exercising their particular function on behalf of the cosmos can be seen as undertaking the defense of Re. Chief among the deities who battle Re’s enemies for him are the numerous Goddesses bearing the epithet ‘Eye of Re’, such as Hathor, Sekhmet, Tefnut and Wadjet; the God Seth, which is noteworthy inasmuch as the latter has negative associations in other important contexts; and the God Horus, especially in the form of Horus Behdety, the ‘winged disk’. Recognizing the distinction between the divine potency in the sun and the sun as a natural entity allows one not only to differentiate Re from the physical sun, but also to better understand the fusion of Re with other Gods in compound forms such as Amun-Re. Such compounds, which occur among many different Gods in Egyptian religion, do not involve the dissolution of the identities of the Gods in question. In the case of compounds with ‘-Re’, the combined forms bear almost without exception the iconography, not of Re, save for solarized headdresses, but of the other God in the combination. In general, affixing ‘-Re’ to the name of another God expresses that God’s assumption of the central role which the sun plays in the cosmic system. That is, the combined form with ‘-Re’ is the theological expression of a thesis about the central disposition of the solar potency in the order of nature and of the solar principle in the order of thought. This thesis, most forcefully articulated in the New Kingdom, makes itself felt in theology but is perhaps misleadingly referred to as the ‘New Kingdom solar theology’, to the degree that it is a philosophy, one which leaves untouched that which forms the foundations of Egyptian theology, namely the manifold of individual Gods and the body of myths, symbols and rites associated with them. Despite Re’s extensive fusion with other Gods, it is possible to discern a cycle of myths which seems to have belonged originally and exclusively to him. Re is apparently originally regarded as the child of Nut or else of Mehet-Weret, born upon the primordial mound whose emergence from the waters of the abyss, personified as Nun, marks the initial creative impulse in the cosmos. This tradition seems to have been independent both of that attributing the original creative impulse to Atum, resulting in the conception of Shu and Tefnut, as well as that for which Nut is primarily the mother by Geb of Osiris, Isis, Seth and Nephthys. It would not be accurate to see in Nun Re’s father, since what is emphasized about Nun is his inertness; the Gods who come to be in Nun create themselves. Hence Re speaks of Nun in the Book of the Celestial Cow as his elder, in whom he came to be, but not as his progenitor, nor does Nun imply that this is the case. Re is born from Nut every morning, voyages across the sky in his ‘day bark’, then enters her body again at sunset to voyage in the ‘night bark’ through the netherworld, the ‘inside’ of the sky, so to speak, to be born again at dawn. He is thus his own father and his own son. It seems impossible to interject a linear narrative development into this cycle having neither beginning nor end; but another body of myth associated with Re posits him as having undergone a significant change of state in the ideal, timeless ‘past’. This myth is recounted primarily in the aforementioned Book of the Celestial Cow (trans. in Piankoff 1955; translations also in Lichtheim, Ancient Egyptian Literature, vol. 2, and in Simpson, et al., Literature of Ancient Egypt). In this text, Re is depicted as having reigned originally over Gods and mortals alike without intermediaries, but he grows old and humans become rebellious. Rebellious humanity is attacked first by Hathor in the desert, then by Sekhmet in the riparian lands, each acting in her capacity as Re’s powerful ‘Eye’ (irt), the enforcer of his will (the Egyptian verb ir, ‘to do’, the participial form ir.t, ‘doer’ or agent being evoked by irt, ‘eye’). These actions foreshadow the ultimate development in the myth, namely Re’s decision to distance himself from mortals and delegate the governance of the mortal world to other Gods (Geb, Osiris and Thoth are specified). Re is lifted up to the sky by Nut in the form of a great cow. The theme of Re delegating power to other Gods is also encountered in a myth concerning Isis (no. 84 in Borghouts), in which Isis crafts a scorpion to poison Re, then demands Re reveal to her his secret name, by the magical efficacy of which she can cure him. This magical efficacy transmitted to Isis is in turn used by her on behalf of her son Horus. A different body of literature involving Re, less mythical than magical in nature, are the various New Kingdom netherworld books such as the Amduat book (for this class of literature see Hornung 1999). These books, in general, are accounts of Re’s nocturnal journey through the netherworld, or duat, which is divided into the hours of the night. The form in which Re makes this journey is called Ifu-Re, ‘flesh-of-Re’. As the boat of Re and his entourage enters each hour, the divinities, potencies and souls who reside in that hour are illuminated and interact with the boat. The climax of Re’s journey is his rendezvous with Osiris at or near the middle of the night. In these books, Re’s illumination of the netherworld is the engine of resurrection and its power supply. The mythic charter for the creation of such books is provided in the Book of the Celestial Cow. Before Re’s withdrawal from the mortal realm, access to Re’s spiritual illumination was universal and immediate for mortals; after his withdrawal, this illumination is dependent upon their own wisdom and virtue. Hence the partially illuminated space of the netherworld effectively embodies this withdrawal of Re. Since mortals will require knowledge in this new order, Re charges Thoth with writing down the things which are in the netherworld. Another expression of the relationship Egyptians conceived between Re and humans is the tradition that humans came into existence from tears shed by Re or Atum. While this myth has its basis in the similarity between the words for ‘tears’ and for ‘people’ in Egyptian, it also underscores once again the fundamental Egyptian idea of a distance between humans and the natural or cosmic order, a distance which is even painful on some level for the Gods themselves. This distance is made concrete where it is specified that Re (or Atum) wept because he was separated from his ‘Eye’, i.e. his agency or ‘doing’. When she returns, he has fashioned a new eye, so he places the original ‘Eye’ upon his forehead, i.e., as the uraeus serpent whose flame is the defense of the cosmic order Re has established. This order involves a painful degree of separation between the natural order and human experience; but the work of healing this rift is immediately taken up by the Gods who occupy the space thus created, Gods such as Isis or Thoth, whom Re assists by delegating some of his own power. Re also is said to have created Hu (authoritative utterance) and Sia (perception/understanding) from blood which he shed when he cut his phallus, possibly a reference to circumcision (BD spell 17). 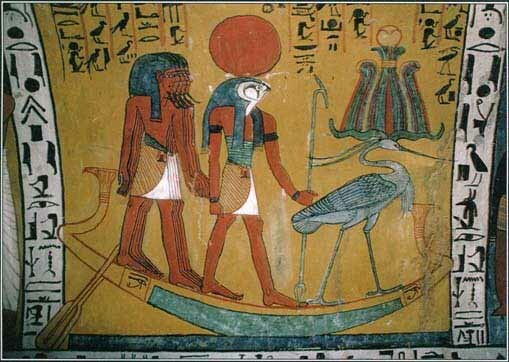 Hu and Sia are often depicted guiding the solar boat, as is Heka, the divine personification of magic itself, and Goddesses such as Hathor or Isis. That elements of perception and cognition are so prominent among the ‘crew’ of the solar boat implies that the boat is a figure of mind and its powers. The power of magic, once imparted to humans, allows them to assist not only themselves, but also Re in his maintenance of the cosmic order. This is made explicit in The Book of Overthrowing Apophis, a series of ritual texts directed against Apophis, the divine embodiment of entropy and all anti-cosmic forces, who each day attacks the solar bark and each day is repelled by the collective efforts of the other Gods and, apparently, of humans too, for Re states that “the tears which came forth from mine Eye,” i.e., humans, “are against you [Apophis]” (27, 25; “The Bremner-Rhind Papyrus – III,” p. 173). Later in the same text, Re states that “children fell him [Apophis] and sunder his soul from his body and his shade, and the sages who are in the bark and the tears of mine Eye desire to attack them,” and urges that “ye sages who are in this land, and ye Nine Gods who came into being from my flesh, be ye vigilant in felling Apophis,” (29, 8-10; “The Bremner-Rhind Papyrus – IV,” p. 42). Humans, whether sages or mere children, play a vital role in partnership with the Gods in sustaining the cosmos against the forces of entropy. Re is also at the center of a text known as the ‘Litany of Re’, although its proper title is “The Book of the Adoration of Re in the West and of the Adoration of the One Joined Together in the West.” The joined-together-one is, in effect, the third entity created by the union of Re and Osiris, the resurrected Osiris infused with the potency of Re. The text takes the form of a hymn of sorts to seventy-four (or, in some versions, seventy-five) ‘forms’ of Re. Its function in the tombs in which it is found is to enact the resurrection of Osiris, that is, the deceased, who is accordingly referred to as “the djeba [‘substitute’ or ‘token’] of the one joined together.” The ‘Litany’ was also for use by the living, however, stating of itself, “This is the victory of Re over his enemies in the West. It is profitable for a man upon earth; it is profitable for him after his burial.” The ‘man on earth’ who would perform the ritual is perhaps the “heir of the djeba” referred to in the text. The establishment of a relationship of succession among the living through their participation in the resurrection of their forebears is implicit in Egyptian dogma about the afterlife, but is perhaps intensified in the ‘Litany’ due to its royal provenance, although portions of it were adopted as BD spells 127 and 180; it also formed some part of the liturgy of certain temples in the Late Period. This latter fact underscores the point that where Re is involved it can no longer be strictly a matter of the resurrection of the private individual, but must involve a cosmic element, whether literally royal or pertaining to the eternal sovereignty of the Gods. Re (Ra) was the Egyptian sun god who was also often referred to as Re-Horakhty, meaning Re (is) Horus of the Horizon, referring to the god’s character. The early Egyptians believed that he created the world, and the rising sun was, for them, the symbol of creation. The daily cycle, as the sun rose, then set only to rise again the next morning, symbolized renewal and so Re was seen as the paramount force of creation and master of life. His closest ally is Ma’at, the embodiment of order and truth. Re was also closely connected to the Pharaoh, Egypt’s king. While the king ruled earth, Re was the master of the universe so they were of the same nature and were in effect a mirror image of each other. Interestingly, up until the 2nd Dynasty, there is an absence of references on Re, but his development began in the late 2nd Dynasty and matured through the 5th Dynasty. Re became more and more associated with the king, who was both human and a god at once, embodied in the falcon named Horus and by the 4th Dynasty, referred to as the son of Re. Hence, a relationship also developed between Horus and Re as they were merged in the symbol of a winged sun disk, an icon that remained constant in Temples and religious monuments through the end of Egyptian history. Re’s early worship really became very significant during the 5th Dynasty, when kings not only erected pyramids aligned to the rising and setting sun, but also built solar temples in honor of Re. This sort of temple must have been a difficult conception for the Egyptians, because Re never had a sanctuary with a cult statue. Instead, his image was the sun itself, so the sun temples were centered upon an Obelisk over which the sun rose, and before the obelisk would be an alter for his worship. However, the most significant early solar temple was probably erected at Heliopolis, where a pillar resembling an obelisk made up part of the hieroglyphs for the city’s name, Iwn. Unfortunately, that structure is now completely destroyed. These 5th Dynasty rulers were also responsible for the first Pyramid Texts during the Old Kingdom, a collection of spells describing the journey of the dead pharaoh through the underworld. These texts were some of the first decorations inscribed in Pyramids, and are an important source of information on the sun god. ”dost manifest thyself when thou comest into being above Nu*. The story of creation related in the Pyramid Text explains that Re, as Atum, rose in the beginning of creation as a benben stone, an obelisk-like pillar, in the temple of the Benu-Phoenix in Heliopolis. He then spit forth Shu and Tefnut, who became the first godly couple, and who respectively, symbolized air and moisture. To them, Geb and Nut, were born, symbolizing the earth and sky. Geb and Nut, in turn, begot two divine couples consisting of Osiris – Isis and Seth – Nephthys. Called the Ennead of gods, the combined attributes of this divine group were needed in order for the world to function. However, while Re is never paired with a goddess, he also bears several other off springs including, among others, his son the king, who becomes one with his father in death and the Goddess Hathor, who is often depicted with the solar disk in her headdress. The story continues with Osiris, who is murdered by his brother Seth. In this version of the story, Re resurrects Osiris to rule over the dead. The deceased pharaoh identifies with both Re and Osiris, thus forming a link between them. Though Re and Osiris might be seen as complete opposites, death was not seen by the ancient Egyptians to be the end of life, but rather its original source. Thus, in the Pyramid Text, Re is perpetually resurrected in the mornings in the form of a scarab beetle, Khepri, which means the Emerging One. He rides on the primordial waters, called Nun, in his sacred bark (boat) along with a number of other deities across the sky, where at sunset he becomes Atum, the “All Lord”. At sunset, he is swallowed by the goddess Nut, who gives birth to him each morning again as Khepri. Therefore, the cycle continued with birth, life and death. By the Middle Kingdom (about 2055 BC – 1759 BC), Re’s character evolved and now several hymns tell us that he created the earth solely for mankind, who are made in his image. Now, evil, the opposite of Ma’at, comes from mankind’s own deeds. While in life, it is the king who controls humans, rewarding the obedient and destroying the disobedient and evil, in death, it is Re who fills this role. Furthermore, we find a newly defined relationship between Re and Osiris. Mortals now become Osiris in death, a concept that would make Osiris very popular with common Egyptians who were rather excluded theologically from the prior myths. Re and Osiris travel through the underworld together at night, and the sun god’s birth in the morning is symbolized by an amulet in the form of a scarab beetle that becomes very popular among Egyptians of this period. It is also at this time that Re takes on additional attributes by his combination with other gods. This is often seen as a political move to unite important gods of different regions, and so we see Re, who was most prominent in the north combined with another creator god, Amunof southern Egypt into Amun-Re. He was also combined with a number of other creator gods. By Egypt’s New Kingdom (about 1539 BC – 1069 BC), Re’s reverence was at its peak. Now, the tombs of kings such as those in the Valley of the Kings on the West Bank of modern Luxor (ancient Thebes) contained complex decorative themes depicting the various books of the underworld describing the sun’s nightly journey. Here, Re is depicted with the body of a human and the head of a ram. These books record the sun god’s nocturnal voyage hour by hour. In the fifth hour, Re suffers death and is united with his corpse, Osiris. Yet at the same time, new life springs forth. In the twelfth hour, when the sun rises once more, Re is newly born as a scarab. Another text, called the Litany of Re, describes how the king is identified with some 75 different underworld figures of Re. We know much more of the theology of Re during the New Kingdom because of Papyri recounting his myths. Actually, there are two forms of the myth, with the first focusing on Re as an elderly and tired deity. In this theme, he organizes the world so that he is no longer required to intervene in human affairs and transfers his powers to Horus, the King, thus conceding the throne to his physical son. However, some New Kingdom temples were built with an open courtyard with an alter for Re, where the priests, or theoretically the king himself, would recite one of twelve poetic hymns predicting the victorious course of the sun, each our of the day. In these temples, the rising sun is sometimes depicted as a squatting human infant, while the full, daylight sun takes on the form of a human adult. During this period, the king is very directly identified with Re. H Amenhotep III, for example, calls himself “the dazzling sun”, while Amenotep IV, the heretic king who later called himself Akhenaten, even went so far as to make the cult of the solar disk, called Aten, a semi-monotheistic religion. And while Akhenaten’s efforts were reversed after his death, Amun-Re nevertheless became a universal god, all encompassing, who maintained life for the sky, earth, the other gods and humans. However, it should be noted that at times, so powerful was the cult, particularly of Amun-Re, that the priests of the cult threatened the kingship. Towards the end of the New Kingdom, what was now Re-Horakhty-Atum became more closely associated with the mummiform shape of Osiris, who was generally seen as the nocturnal manifestation of Re. By now, Osiris had become a god of the people so that anyone could make the journey in Re’s nocturnal bark, so we see in this merger a democratization of Egyptian religion. Hence, we find magical papyri from different social strata intending to protect both the living and the dead, which relies on solar symbolism, in order to assure the believers resurrection. We also find many amulets placed on the mummies of both royalty and non-royalty to protect the dead. These solar symbols include the sun in the horizon, the sun disk, the celestial bark, the double lion and the obelisk. There was also a disk showing Re with four ram’s heads, a nocturnal form called a hypocephalus. Though Re lived on in various forms into the Greco-Roman period, his worship gradually deteriorated during the first millennium. This decline was probably due to the weakening of the kingship under various foreign rulers. Though he continued to be a part of Egyptian theology, he was no longer a part of the peoples living faith. Devotion to Re became more and more limited to priests of the temple. Ra (alternatively spelled Ré), Egyptian *ri:ʕu, is the ancient Egyptian sun god. The meaning of the name is uncertain, but it is thought that if not a word for ‘sun’ it may be a variant of or linked to words meaning ‘creative power’ and ‘creator’. By the Fifth Dynasty he had become a major deity in ancient Egyptian religion, identified primarily with the mid-day sun. In later Egyptian dynastic times, Ra was merged with the god Horus, as Ra-Horakhty (“Ra, who is Horus of the Two Horizons”). He was believed to rule in all parts of the created world the sky, the earth, and the underworld. He was associated with the falcon or hawk. When in the New Kingdom the god Amun rose to prominence he was fused with Ra as Amun-Ra. During the Amarna Period, Akhenaten suppressed the cult of Ra in favour of another solar deity, the Aten, the deified solar disc, but after the death of Akhenaten the cult of Ra was restored. All forms of life were believed to have been created by Ra, who called each of them into existence by speaking their secret names. Alternatively humans were created from Ra’s tears and sweat, hence the Egyptians call themselves the “Cattle of Ra.” In the myth of the Celestial Cow it is recounted how mankind plotted against Ra and how he sent his eye as the goddess Sekhmet to punish them. When she became blood thirsty she was pacified by mixing beer with red dye. To the Egyptians, the sun represented light, warmth, and growth. This made the sun deity very important and the sun was seen as the ruler of all that he created. The sun disk was either seen as the body or eye of Ra. Ra was thought to travel on two solar boats called the Mandjet (the Boat of Millions of Years), or morning boat and the Mesektet, or evening boat. These boats took him on his journey through the sky and the underworld. When Ra traveled in his sun boat he was accompanied by various other deities including Sia (perception) and Hu (command) as well as Heka (magic power). Sometimes members of the Ennead helped him on his journey, including Set who overcame the serpent Apep and Mehen who defended against the monsters of the underworld. Apep, an enormous serpent tried to stop the sun boat’s journey every night by consuming it or by stopping it in its tracks with a hypnotic stare. 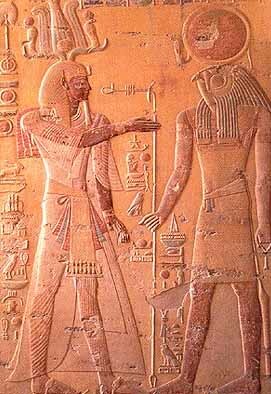 In the evening the Egyptians believed that Ra set as Atum or in the form of a ram. The Mesektet or Night boat would carry Ra through the underworld back towards the east in preparation for his rebirth at sunrise. 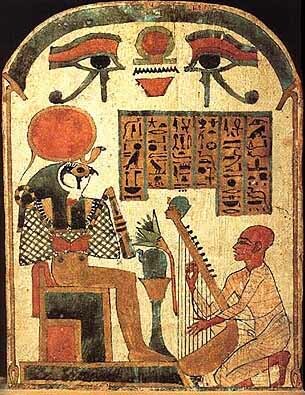 These myths of Ra represent the sunrise as the rebirth of the sun by the sky goddess Nut, thus attributing the concept of rebirth and renewal to Ra and strengthening his role as a creator god. As with most widely worshiped Egyptian deities, Ra’s identity was often combined with other gods. Amun was a member of the Ogdoad, representing creation energies with Amaunet, a very early patron of Thebes. He was believed to create via breath, and thus was identified with the wind rather than the sun. As the cults of Amun and Ra became increasingly popular in Upper and Lower Egypt respectively they were combined to create Amun-Ra, a solar creator god. The name Amun-Ra is reconstructed as *[riːʕu]). It is hard to distinguish exactly when this combination happened, but references to Amun-Ra appeared in pyramid texts as early as the fifth dynasty. The most common belief is that Amun-Ra was invented as a new state deity by the (Theban) rulers of the New Kingdom to unite worshipers of Amun with the older cult of Ra around the eighteenth dynasty. In later Egyptian mythology, Ra-Horakhty was more of a title or manifestation than a composite deity. It translates as “Ra (who is) Horus of the Horizons”. It was intended to link Horakhty (as a sunrise-oriented aspect of Horus) to Ra. It has been suggested that Ra-Horakhty simply refers to the sun’s journey from horizon to horizon as Ra, or that it means to show Ra as a symbolic deity of hope and rebirth. (See earlier section: Ra and the sun). Khepri was a scarab beetle who rolled up the sun in the mornings, and was sometimes seen as the morning manifestation of Ra. Similarly, the ram-headed god Khnum was also seen as the evening manifestation of Ra. The idea of different deities (or different aspects of Ra) ruling over different times of the day was fairly common, but variable. With Khepri and Khnum taking precedence over sunrise and sunset, Ra often was the representation of midday when the sun reached its peak at noon. Sometimes different aspects of Horus were used instead of Ra’s aspects. Ra is represented in a variety of forms. The most usual form was a man with the head of a hawk and a solar disk on top, a man with the head of a beetle, a man with the head of a ram, a ram or beetle and also a phoenix, heron, serpent, bull, cat, lion and other creatures. The chief cult centre of Ra was Heliopolis (called Iunu, “Place of Pillars”, in Egyptian), where he was identified with the local sun-god Atum. Through Atum, or as Atum-Ra he was also seen as the first being and the originator of the Ennead, consisting of Shu and Tefnut, Geb and Nut, Osiris, Set, Isis and Nephthys. His local cult began to grow from roughly the second dynasty, establishing Ra as a sun deity. By the fourth dynasty the pharaohs were seen to be Ra’s manifestations on earth, referred to as “Sons of Ra”. His worship increased massively in the fifth dynasty, when he became a state deity and pharaohs had specially aligned pyramids, obelisks, and solar temples built in his honour. The first Pyramid Texts began to arise, giving Ra more and more significance in the journey of the pharaoh through the underworld. The Middle Kingdom saw Ra being increasingly combined and affiliated with other chief deities, especially Amun and Osiris. During the New Kingdom, the worship of Ra became more complicated and grander. The walls of tombs were dedicated to extremely detailed texts that told of Ra’s journey through the underworld. Ra was said to carry the prayers and blessings of the living with the souls of the dead on the sun boat. 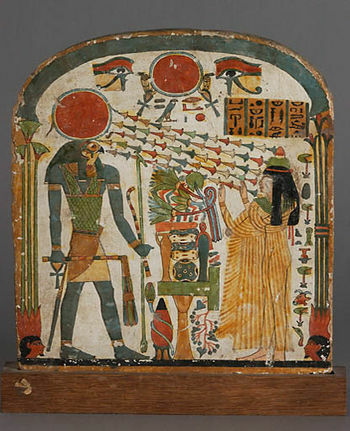 The idea that Ra aged with the sun became more popular with the rise of The New Kingdom. Eventually, during the reign of Akhenaten (mid 1350s-1330s), the worship reached the level of “uncompromising monotheism”. Though worship of Ra was widespread, his cult center was in Heliopolis in Lower Egypt. Oddly enough, this was the home of the Ennead that was believed to be headed by Atum, with whom he was merged. The Holiday of ‘The Receiving of Ra’ was celebrated on May 26 in the Gregorian calendar. The rise of Christianity in the Roman empire caused an end to the worship of Ra by the citizens of Egypt, and as Ra’s popularity suddenly died out, the study of Ra became purely for academic knowledge even among the Egyptian priests.